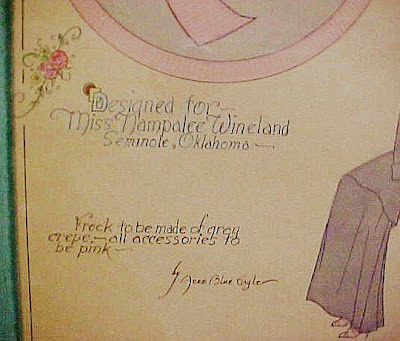 I found this interesting little tid bit about well-known Native artist Acee Blue Eagle (1909-1959) who created an original watercolor of a personal fashion design for Miss Nampolee Wineland, of Seminole, Oklahoma. 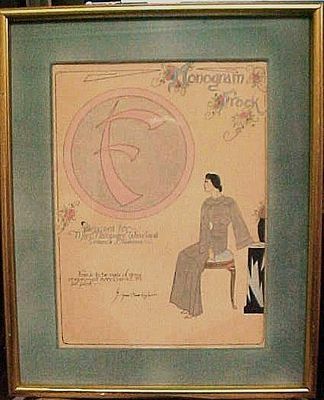 Commissioned by Miss Wineland, the work is entitled "Monogram Frock" (Wineland signed her initials as "N.W.F. ), and instructions as to how the dress is to be made are included with the rendering. Acee Blue Eagle has signed his work below the instructions. This is a unique piece demonstrating how Native artists were creating chic designs during this time period. Acee Blue Eagle, a Pawnee-Creek Native American, was born near Anadarko, Oklahoma. He was an artist and a teacher who had a very distinguished and widely varied international career. 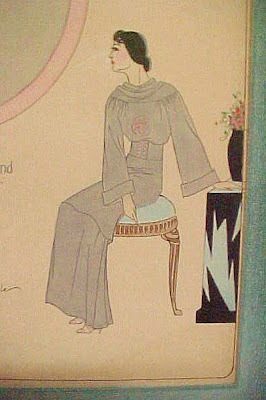 His works are shown at the Philbrook and Gilcrease Museums in Tulsa, The Institute of the American Indian in Sante Fe and the Smithsonian in Washington, D.C., among many others. He was named as Outstanding Indian in the United States in 1958.